What Dog Training tools should you use? Well, if we are talking about aversives, and you’re not a Dog Training Service professional, you shouldn’t use any. But if you’re getting your dog trained, I recommend these 5 items. I used halti collars for intermediate training and E-collars for Advanced Dog Training, but these listed are a must. You might not think of food as a tool but it’s part of the dog training process. The look how quick I can train your dog mentality is pretty popular these days. And we should be efficient dog trainers but the fundamental work should be positive reinforcement. Sure, I can get a dog to go to place in 5 minutes. Who can’t? But is it really faster if the dogs breaking his commands later on? Learn to train effectively and even positioning of the dog is reliable in the later stages. Using food to train your dogs bypasses the potential to trigger aggressive behavior in them. Some trainers will say but it’s already in the dog. Yes, genetics play a factor but it’s not up to us to add that experience to the dog’s memory. Save Your Dog’s Life – Ever handled or been around a dog with a regular flat color? Just a little too loose in the dog can pull right out of it and end up in the street. Not with a Martingale. 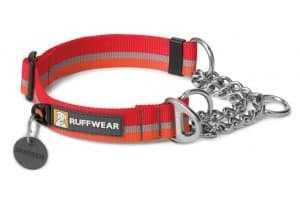 It simultaneously tightens around the dog’s neck when he pulls. Everyone who has the dog should think “Safety First”. Save Your Life – Okay so it probably won’t literally save your life but at least the quality of it. You’ll be less likely to fall and bust your hip when using a Martingale collar. The little extra control from the color will slow your dog down some. Martingale as in Aid – I also use the Martingale collar as a secondary collar for dog training service. I connect the collars ring to the Ring of a prong collar (the ring that doesn’t spin). for this I use a carabiner or 3 to 4 in line with double connectors. Someday one of those links from the metal prong collar will come loose. I listed these colors together because they are very similar. What’s my favorite brand of prong collar? I use Herm Sprenger. Think of this color as a metal Martingale. It looks kind of scary but if used correctly it’s actually one of the safest collars. Compared to the Starmark the pawn helps hard dogs (less sensitive to touch) prioritize. Can Cause Dog Aggression – When using a prong collar, if a dog becomes aggressive, freaks out, or clearly doesn’t understand it, you’ve used it incorrectly. I don’t begin training dogs with a collar. If you do, you’ll get side effects. Again I do not recommend using a prong collar unless you’re a Dog Training Service professional or getting your dog trained. Star-mark – Want a prong style collar but more gentle? Starmark is the answer. It’s a plastic version and the links are less intrusive. The Starmark is ideal for soft dogs (sensitive to touch). Honestly these should be used to train all dogs, if possible. The long line allows you to work on recall, give exercise, or just more freedom. Also consider these pointers Unlike the Flexi -Leash the entire long line in is visible all the time. If you want to test if the dog will run you only have to catch the end of the long line. Why not four foot? If your dog training service style is unique like mine, the length of my recommended leash will offer many benefits. Plenty of slack to do a finger lock. Give us a little distance for training. And room for your zip (left) hand to practice the leash tension test (to make sure your dog doesn’t break command). White leather? I mean, nylon is actually stronger right? Yeah but the leather leash is easier on the hands!